But does the conflict level in Mexico feel like the one reported in Afghanistan, Somalia, Iraq or Sudan? It actually does not. It is as if the war is a game of hide-and-seek with the country’s citizens. It is going on “behind” open eyes: Constantly present – in low-income neighborhoods, suburbs or on highways leading North – yet when one turns round, there are only traces to be seen. The effects of this latent violence are bitter and its psychological consequences profound. In political gaming terms, one realizes that this wicked war is also about the hearts and minds of the Mexicans. The drug war, close and impersonal, is accompanied by constant government propaganda on TV, radio or billboards. The amounts invested by the Mexican government (local and federal) in self-praising announcements are impressive. A remarkable array of multimedia techniques are being used in order to make citizens believe that everything is – and is going to be- all right. Mexico’s people haven’t lost their pride and love for their country – but they are desperate. It is not only the political class who is taking advantage of this despair. The private economy is operating in accordance with politicians by playing a similar game. People starve for hope, and this is what the economy has smartly sensed and learned how to use, for its own purposes. Oxxo, Mexico’s largest chain of convenience stores, for example, started in 2010 its “I believe in you, Mexico”– campaign. Oxxo directors justified their campaign by saying that “believing in Mexico means having a responsible attitude and a sense of compromise for a better future”. Mexican multimedia conglomerate Televisa also understood that despair is an exploitable marketing tool. In 2010 it launched INICIATIVA MÉXICO, a TV show meant to “detonate a profound reflection about the responsibility Mexicans have to forge the country”. The project, involving academic institutions and social organizations, had a respectable purpose, but a doubtful social impact. Who will get Mexico out of this absurd theater of war? 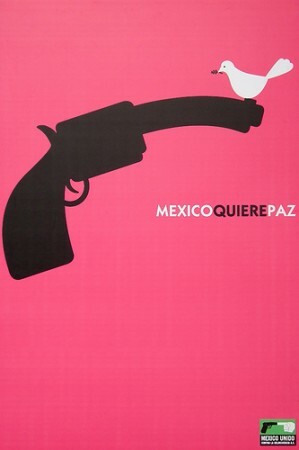 For 2011 there is a glimmer of hope since analysts believe that Mexico might be reaching a new pax narcotica. But meanwhile its citizens will need to content themselves with a war in disguise, something one could call a “pax neurotica”. Great insights ! Felicidades !